The UTG 3-9x32 Bug Buster scope is completely sealed and 100% nitrogen filled. It is shock, fog, and rain proof for maximum reliability when mounted on your firearm or airgun application. 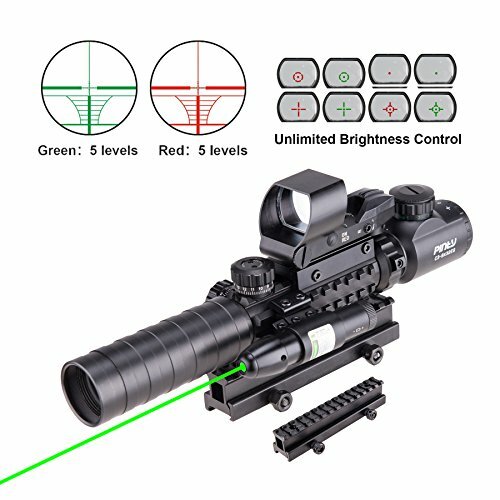 Dual red and green illumination and an accommodating eye relief makes this scope a no brainer for all shooters who find themselves in the most diverse of environments and weather conditions. Standard for the SCP-M392AOLWQ is the included 2 sunshade, quality flip-open lens caps, and quick detachable rings. This 3-9X32 Bug Buster is ready to meet your shooting needs right out of the box. The innovative True Strength(TS) Platform is a signature scope construction platform. Most significantly, it includes a Smart Spherical Structure(SSS) controlling the joint-like interaction between a scope s inner and outer tubes. The design provides long lasting reliability in these interactions to guarantee precise and responsive windage/elevation adjustment over time. TS has been at the heart of every genuine Leapers scope for more than a decade and has been fully tested on scope-killer airguns and elephant rifles with extreme recoil. We perform our testing based on actual users' input. We gather usage intelligence from all deployment aspects, carefully analyze their impacts and develop appropriate test parameters to ensure optimal performance under all conditions. TS has been at the heart of every genuine Leapers scope for more than a decade and has been fully tested on scope-killer airguns and elephant rifles with extreme recoil. Well-designed and constructed target turrets allow for crisp, consistent and precise windage and elevation adjustments. Its locking and re-setting features protect and complement one of the most critical parts in the optic for proper zeroing. 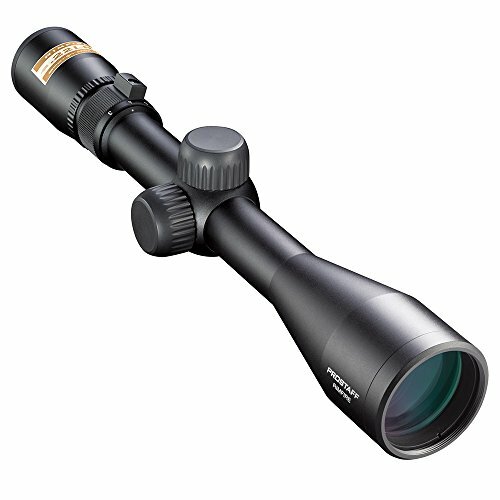 Uncommon throughout the market, this particular scope series achieves an impressive and unparalleled parallax free view from as close in as 3 yards out to infinity using its adjustable wide angle front objective. Leapers/UTG pioneered red AND green reticle illumination in this industry in 2004, allowing for even more effective scope use under diverse environments and lighting conditions. The innovative side wheel control was then introduced for the RGB illumination, getting away from the traditional bulky rheostat on the eye piece and giving users quick and easy access for reticle light. Leapers/UTG started introducing mil-dot reticle optics from as early as 2003, pioneering the Range Estimating concept as a useful tool for hunters and shooters around the world. Today, the mil-dot reticle is widely accepted and used in this industry. Leveraging our years of experience in this area, UTG developed and refined the unique Tactical Range Estimating(TRE) mil-dot reticle and offers this feature in almost all of our optics. With some patient learning and practice using our TRE, shooters can enhance accuracy and performance in ways not imagined before. 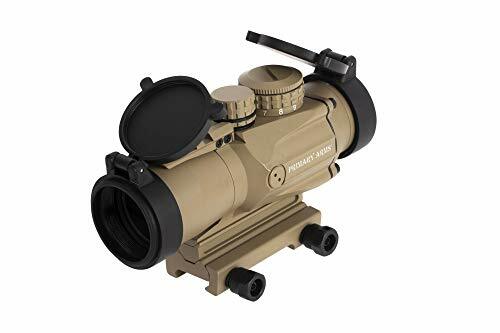 Regular mil-dot reticles found on the market usually have 4 dots in each direction of the cross hair, giving you 9 different aiming points for either windage or elevation. If you count the 2 inner tips of the opposite duplex cross hairs, you get 11 aiming points. In contrast, Leapers/UTG 36 Mil-Dot Tactical Range Estimating Reticle (TRE) has 9 dots on each direction of the cross hair, giving you 19 aiming points or 21 including the inner tips of the duplex cross hairs. UTG aims to provide application and solution oriented products, including useful and most commonly sough-after accessories. In addition to the flip-open lens caps, a 2 sunshade and a pair of medium profile Max Strength heavy duty rings are included. The rings, with a saddle height of 15mm, fit on Picatinny/Weaver rails and are secured with patented, fully adjustable quick detach lever locks. Precise 1/4 @ 50 yards adjustment. Look through scope 3 or 4 inches away from your eyepiece lens. 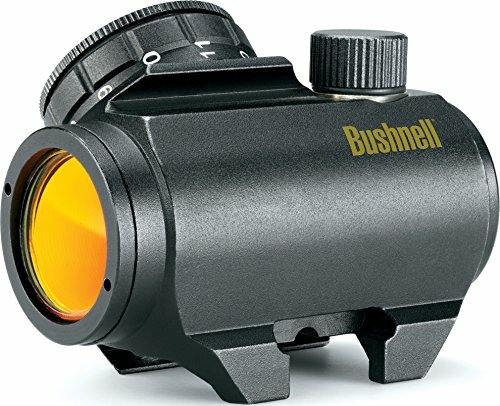 If the reticle is not clear, loosen the knurled lock ring and rotate the eye bell until it is clear. Then tighten the lock ring firmly. Rotate the tube of the scope so that the vertical line and horizontal line of the Mil-dot show respectively. 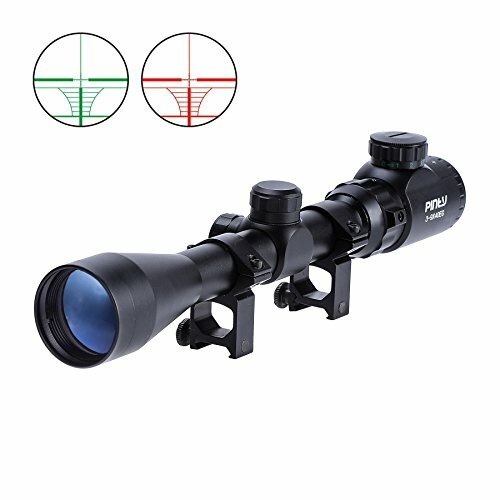 Adjust the position of scope on the rifle until you can see things clearly through it and your eye feel comfortable. Then tighten all screws to fix scope firmly to the rifle. Keep the scope in a place free of acid, alkaline and other corrosives. Dust and dirt on the surface of the scope should be cleaned with soft cloth or tissue and a little alcohol. 4 in 1, comes with a rangefinder riflescope, a green laser sight and a red/green dot sight everything you will ever need. 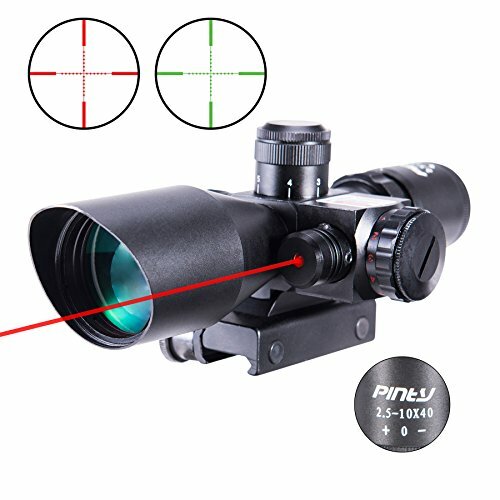 Magnifications from 3X up to 9X, green/red illuminations with 5 brightness adjustments for both the riflescope and electronic unlimited brightness control for the dot sight, 4 reticle patterns also available for the red/green dot sight. HD119 red/green dot reflex sight with bottom switch - highly accurate optic and substitute for overpriced holographic clear, high resolution image unlimited eye relief and wide field of view. Picatinny mount easily mountable to any 22/11mm rails (Picatinny or Weaver); Multi-coated optics with O-ring sealing and nitrogen filling ensures 100% water and fog-proof. X Sight II may be the first digital scope to break the true HD barrier, but it is one of the best long range rifle scopes on the market! What makes ATN s product far superior to its competition? Easy Answer, it s this hunting scopes capability to maneuver the elements, provide collected data of every shot and adjust profile for every possible condition, ensuring the scope is zeroed and ready at any range! The X Sight provides clear images, for all your day or night hunting needs. Use Day and Night in HD resolution - take your shots in color at high resolution, with no blurry images regardless day or night! Smart Rangefinder - built in rangefinder allows you to range your target without carrying additional equipment. The rangefinder will calculate the distance of an object from the point you are viewing 3D Gyroscope and E-compass The scope has a gyroscope built into them. The gyroscope keeps images steady and blur-free. Smart e-compass helps you navigate by showing you your heading E-Zoom - lets you magnify to target without losing what s in your FOV like with step zoom systems 1080p HD Video Recording & Photos, Wi-Fi Streaming - allow you to record all of your hunting trips, you can use your phone / tablet as a viewfinder. Firmware upgradeable Owning a high caliber, state of the art digital night vision riflescope is within your reach and all you have to do is say, yes! When situations demand split-second target acquisition and maximum field of view, mount up the STRIKEFIRE II and shoot-both eyes open. Feature-rich, versatile and reliable, the STRIKEFIRE II is a great choice for shooters who want a quality red dot sight, but don't want to break the bank. Features sleek rear-facing controls for power on/off and easy adjustment of ten dot intensity levels, lowest two settings are night-vision compatible. Automatically returns to the last dot intensity used when powered up. The 30mm aluminum alloy chassis provides extra-high recoil rating and is waterproof and fog proof. Strike fast! INCLUDE VORTEX OPTICS LENS PEN. The Strikefire II Red/Green Dot is a rugged, reliable red dot sight that is at home in a variety of shooting applications. It allows the shooter to operate between two dot colors and ten brightness settings to easily adjust for changing conditions. Fully multi-coated lenses provide a clean and bright, unobscured point of view. Unlimited eye relief allows for rapid target acquisition. The single-piece chasis is compact and lightweight but still delivers shockproof performance withstanding both recoil and impact. Nitrogen purging and o-ring seals ensure fogproof and waterproof performance. An offset cantilever mount is provided; allowing you to move the sight forward to be used in conjunction with a magnifier and backup iron sights all on the same rail. With aesthetics and functionality in mind, the power controls are at the rear of the Strikefire for easy access. The Strikefire II runs off a CR2 battery. 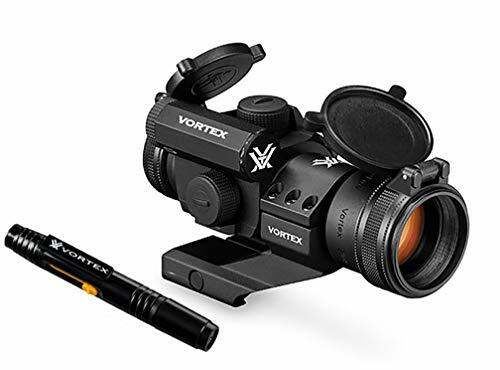 Vortex Optics lens pen included. ACCURATE - Crisp 2 MOA red dot sight allows for accurate, both-eyes-open shooting. 11 red dot brightness settings provide optimal visibility in any light conditions. Multi-coated, scratch resistant lenses provides enhanced image clarity. FLEXIBLE - Easily flip the 3x Magnifier to go from up-close shooting to long range precision with ease! 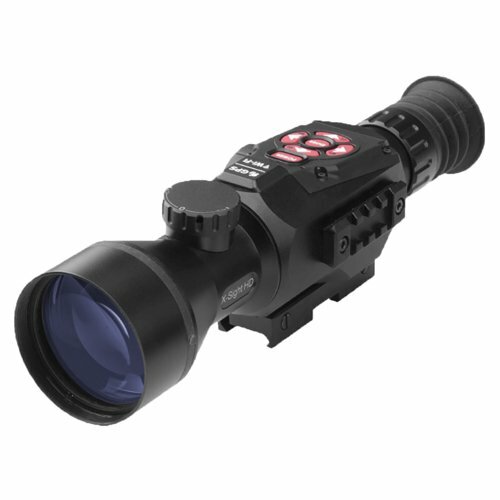 The magnifier allows you to use your red dot sight like a scope when needed. DEPENDABLE - Red Dot is Fully waterproof with sealed housing, and shockproof circuitry resists damage from rough handling. The Magnifier has a durable 6061-T6 housing with a steel mount for a solid hold and positive lock-up. Lifetime Warranty on the whole package! The heart of our tough 3X Prism Scope is the ACSS 5.56 CQB-M2 reticle that combines ranging, wind leads, moving target leads, and ballistic drop compensation out to 600 yards. The outer horseshoe of the glass etched reticle is used for close quarters engagement, simply place the generous semi-circle on the target and run with it! Each side of the horseshoe also has an integrated ranging system. Place the bottom of the target on the bottom rung, and range up. If you know your targets are roughly 18 inches wide, they can be ranged on the side Auto Range system, or directly on the BDC hold overs! Two dots on either side of the inner horseshoe offer a moving target lead moving with an average speed of 8.6 MPH. Each step of the BDC system includes a 5 MPH wind hold, drastically improving first hit probability at any range. As an added bonus, the glass etched reticle does not require batteries or illumination, but 11 brightness settings (including daylight bright) allow for fast acquisition in close quarters, or enhanced visibility in fading light, powered by a common CR2032 battery!